The loss of a critical receptor in a special class of inhibitory neurons in the brain may be responsible for neurodevelopmental disorders including autism and schizophrenia, according to new research by researchers from the Salk Institute for Biological Sciences and the University of California, San Diego (UCSD). The importance of the receptor, called mGluR5, in other areas of the brain had been previously established. Until now, however, no one had studied the receptor’s specific role in a cell type known as parvalbumin-positive interneurons, thought to be important in general cognition and generating certain types of oscillatory wave patterns in the brain. "We found that without this receptor in the parvalbumin cells, mice have many serious behavioral deficits," says Dr. Terrence Sejnowski, head of Salk's Computational Neurobiology Laboratory, which led the research published online in Molecular Psychiatry on August 11, 2015. "And a lot of them really mimic closely what we see in schizophrenia." The article is titled “Disruption of mGluR5 in Parvalbumin-Positive Interneurons Induces Core Features of Neurodevelopmental Disorders.” Scientists had previously discovered that when molecular signaling was disrupted in these cells during development, the brain's networks did not form correctly. Separate studies have revealed that mGluR5 receptors, which transmit glutamate signaling in the brain, are linked to addiction disorders, anxiety, and fragile X syndrome. But, in those cases, mGluR5 is affected in excitatory cells, not inhibitory cells like the parvalbumin-positive interneurons. The Salk team wondered what the role of mGluR5 was in the parvalbumin cells because these cells are deemed so important in brain development. The scientists partnered with Dr.
Scientists at VIB (Flanders Interuniversity Institute for Biotechnology) and KU Leuven (Katholieke Universiteit Leuven) in Belgium have discovered that variable repeats in the triplet nucleotide code (CAG) for the amino acid glutamine tune the function of the protein in which the resulting polyglutamine residues (e.g., the huntingtin protein of Huntington’s disease). 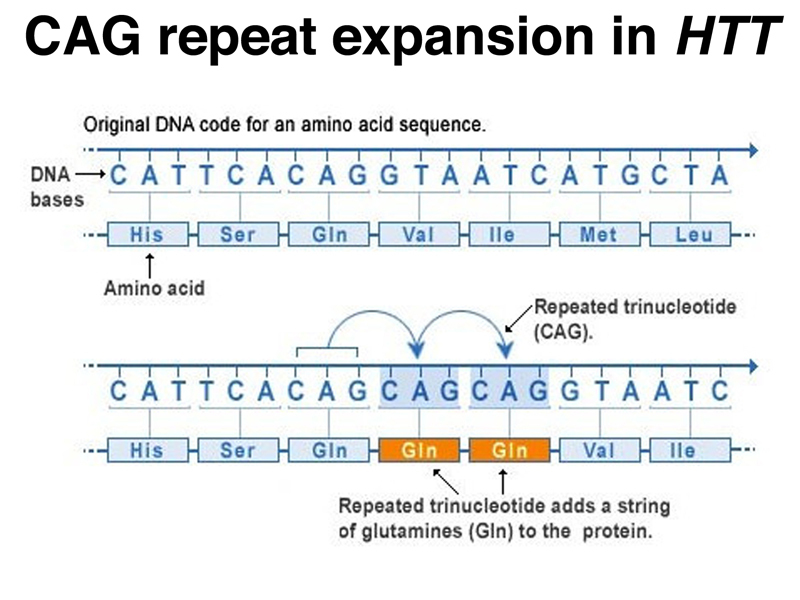 To date, these repeats were known only to cause severe neurodegenerative diseases such as Huntington’s. The new findings from Belgium show that polyglutamine repeats may be more than just harmful elements. The study was published online on August 6, 2015 in an open-access article in Molecular Cell and opens the door to further studies exploring new therapies for human polyglutamine repeat diseases. Moreover, this study lays the foundation for future research into the role of repeats in the emergence and evolution of novel functions and life forms. The Molecular Cell article is titled “Variable Glutamine-Rich Repeats Modulate Transcription Factor Activity.” Excessive numbers of glutamine-rich repeats in various human proteins are known to result in severe neurodegenerative disorders such as Huntington’s disease. Little is known, however, about the physiological role of these repeats and the consequences of more moderate repeat expansions. Dr. Rita Gemayel (VIB/KU Leuven) said, “We found that the polyglutamine repeats act like the dial on a tuner. The length of the repeat modulates the transcriptional response of genes in the cell. More specifically, using a polyglutamine-containing protein called Ssn6 as a model, we showed that the repeat length modulates the solubility of Ssn6 and its interaction with other proteins.